154, but still going strong! The Goh Chor Tua Pek Kong Temple was built in 1847 at Lavender Road (previously, Rochor Road) by Chinese labourers working on Joseph Balestier's sugar plantation, and was refurbished in 1920 and 1928. Currently, the temple undergoes renovations every 5 years. 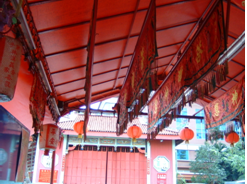 It still retains its name as "Rochor's Grand Old Man Temple", although Rochor Road has been renamed as Lavender Road. The Balestier then was a swampy area infested with tigers and malarial mosquitoes. In 1843, the problem of plantation workers killed by tigers was at its peak, so these workers established the temple dedicated to Tua Pek Kong ("Grand Old Man" in Hokkien), the Taoist deity who is believed to be the guardian saint of overseas Chinese in Southeast Asia. Even now, devotees still come here to pray for peace. 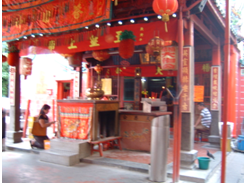 The temple is rather small with a single courtyard and ornate decorative ridges on its roof with dancing dragons, fish, phoenixes and flowers, typical of southern Chinese architecture. This is due to space constraints, forcing it to remain almost identical to how it looked like when it was first founded. Some granite columns in the temple are made by Chinese craftsmen, and there are at least two plaques lining the ceiling bearing the period of the Qing Dynasty. Conventional burners lacking the modern smoke control facility are still used here. Also, the temple has a private car park on temple grounds that takes up more space than the single storey temple itself. The temple is only maintained by five diligent workers, who take turns to clean the place, which is a remarkable feat. In addition, a permanent wayang stage for the temple was erected and funded by Tan Boon in 1906. This is now the only remaining free-standing wayang stage in mainland Singapore, making this temple extremely unique. The stage is still used for puppet shows when feasts are held during celebrations such as the deities' birthdays. According to Mdm Zheng, a worker who has been here for over 30 years, during the Hungry Ghost Festival (the seventh month of the lunar calendar), there used to be hawkers selling a wide variety of goods, but it has been removed since the 1970s.